AXIS “Ground-Operations” Division supports our Aviation Operations. We utilize the latest Leica GNSS base stations and rovers, robotic total stations, digital levels, conventional and cellular communication hardware, National CORS Real Time Network GNSS datasets, and software, including AutoCAD Civil 3D and Map 3D, StarNet Pro, Leica Geo Office, to professionally and quickly manage any base station and/or control (if desired by our client) requirements for our missions. AXIS is now setup to ensure you confidently get data that you can trust …data reviewed and approved by AXIS’ PLS. Plus we take the flying headaches of managing base station requirements for our flight missions. When we make the last minute decision to fly or abort, we take responsible charge of that communication and mobilization. You simply issue us the NTP …we handle the rest. 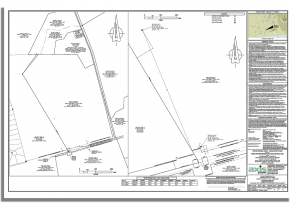 Our PLS will coordinate with, and report to you, regarding datum’s, projections, site control for base station, etc. We take care of placing targets in optimally visible and GNSS observable locations, based on our expertise and decades of experience doing so. We take this aspect of our mission very seriously; it’s what we do, and despite its seemingly simple nature, proper base station data, ground control, panel placement and well planned and executed, redundant GNSS data sets are the foundation of your project. Additionally, we stand ready to perform supplemental data collection tasks; whether it is for QA/QC, topographic surveying in obscured areas, or ties to your existing control on a project, we will precisely and accurately tie the entire data set together to ensure geospatial data continuity. Our experience and equipment also can benefit you when requirements for a project exceed your in-house capabilities, hardware or available staffing. Digital leveling, precision traversing or site specific geometric orientation can all be performed as a supplement to your own capabilities, or as an independent verification of work you have already done. Our field personnel are also OSHA 40 Hour HAZWOPER certified, including Supervisor, and Confined Space capabilities, and participate in medical monitoring programs as required by OSHA and Federal DOT/FAA guidelines. Contact us to discuss your ground support needs.